During “A Perfect Analysis Given by a Parrot,” the last scene of American River College theater’s production of “Honky Tonk Parade,” two characters, Bessie and Flora, are drunk at a bar, and quickly falling in and out of favor with each other, as drunk people often do. The line sums up the play well, in the sense that all of it’s main characters just want to be happy, even if they have to pretend to do it. “Honky Tonk Parade” is much less happy and celebratory than the title suggests. Over and over prior to Bessie and Flora’s scene, the most serious and dark subjects are broached. “This Property is Condemned,” perhaps the best scene of the entire play, features cast member Mary Hill as a young girl named Willie who lives alone in a condemned house on the side of the railroad, and a young boy named Tom who is ditching school to fly his kite. Willie tells Tom all about her life before her sister Alva had died, and how all of her sister’s gentlemen visitors quit coming to see her. Tom’s character does nothing but ask questions throughout the scene, poking and prodding through the details of Willie’s life. She has only a rotten banana for food, but is wearing a dress and scarf as she tip-toes up and down the tracks and sings. The scene, much like others in the play, is raw with emotion, and leaves the audience silent, but rapt with attention. The show also features a number of songs, including “It’s Only A Paper Moon,” popularly sung by Ella Fitzgerald. 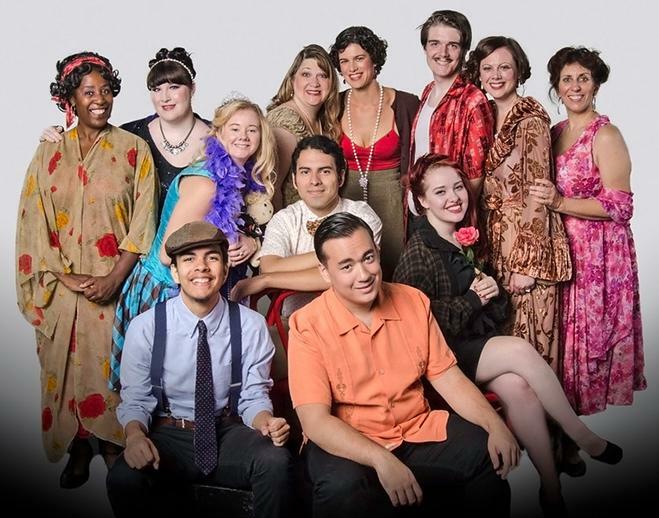 All scenes are one-acts written by the Pulitzer Prize-winning American playwright Tennessee Williams, selected by director Bob Irvin, an ARC adjunct professor and director. At times throughout “Parade,” the acting is robotic and stiff, and with such deep and emotional issues at hand, the stiffness stands out. But more often than that, the acting is wonderfully human in nature, and with material this thought-provoking, the show is worth the cost, and will leave you wondering how much of the work by Williams came from his own life. Be the first to comment on "‘Honky Tonk Parade’ creates some happiness"